Keeping track of time might seem trivial, but knowing the right time is important. That way, your Mac can determine when you created or modified a particular file, and keep track of appointments you’ve made through applications, such as Calendar. 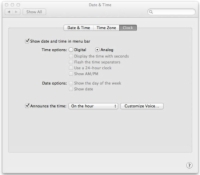 1Choose Command→System Preferences and click the Date & Time icon. Or, Control-click the System Preferences icon on the Dock and choose Date & Time from the menu that opens. 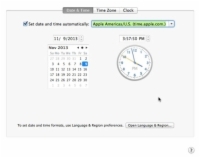 The Date & Time preferences pane appears, as shown in the figure. 2Select (or deselect) the Set Date & Time Automatically check box. If you select this check box, open the drop-down list to choose a location. This feature works only if you’re connected to the Internet. If you aren’t connected to the Internet, click the calendar to pick a date and click the clock to set the time. You can use a different method to set the time. Instead of selecting the Set Date & Time Automatically check box, click the Time Zone tab at the top of the window and then click near your home city on the map. You can also click in the Closest City field and begin typing the name of the city nearest you in the same time zone, or click the drop-down list and select the city nearest you. 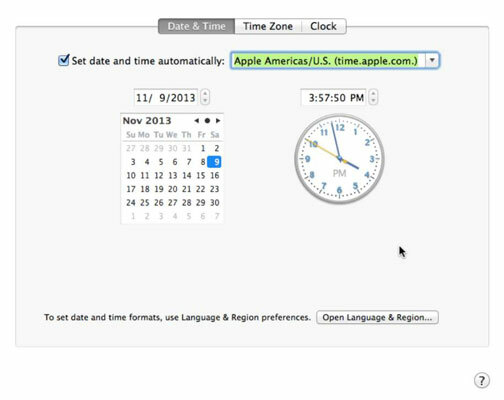 3(Optional) Click Set Time Zone Automatically Using Current Location if you want the clock to change automatically when you travel to a different time zone. This feature works when you have an Internet connection and have turned on Location Services. 4Click the Clock tab and select (or deselect) the Show Date and Time in Menu Bar check box, as shown. If selected, this displays the time on the right side of the menu bar. After you make your selection, you can select the other options to change the appearance of the clock, such as choosing between a digital or an analog clock, and choosing whether to show the day of the week (Digital option only). 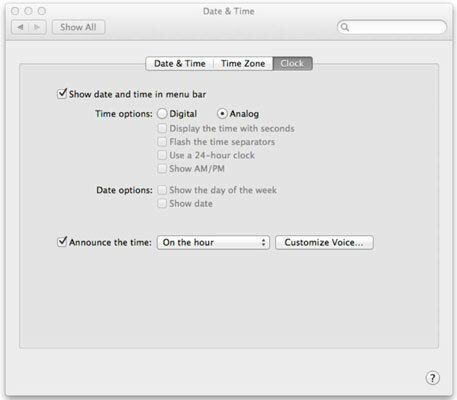 5Select (or deselect) the Announce the Time check box if you want your Mac to recite the time by using a synthesized voice every hour, half-hour, or quarter hour. The associated pop-up menu lets you specify when announcements are made; click the Customize Voice button to choose what kind of voice is used and how quickly and loudly it utters the time. 6Click the Close button to close the Date & Time preferences pane. 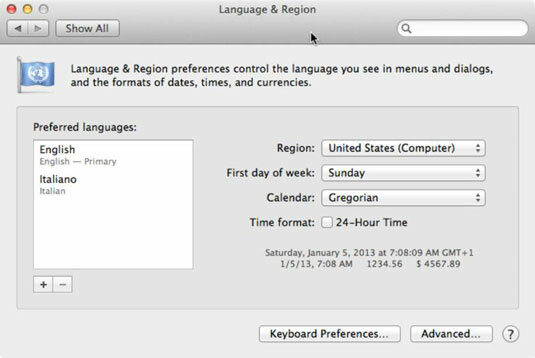 Click the Language & Region icon in System Preferences to change the time and date format based on your language and region. Use the pop-up menus as shown here.